Background: The leaves of Dichrostachys cinerea are used as laxative, diuretic, painkiller. It is also used in the treatment of gonorrhoea, boils, oedema, gout, veneral diseases and nasopharyngeal affections, etc. Materials and Methods: The Phytochemical investigation of ethanolic extract of D. cinerea leaves were performed by standard chemical tests, thin layer chromatography (TLC) by using various solvent systems, and by high performance liquid chromatography (HPTLC). 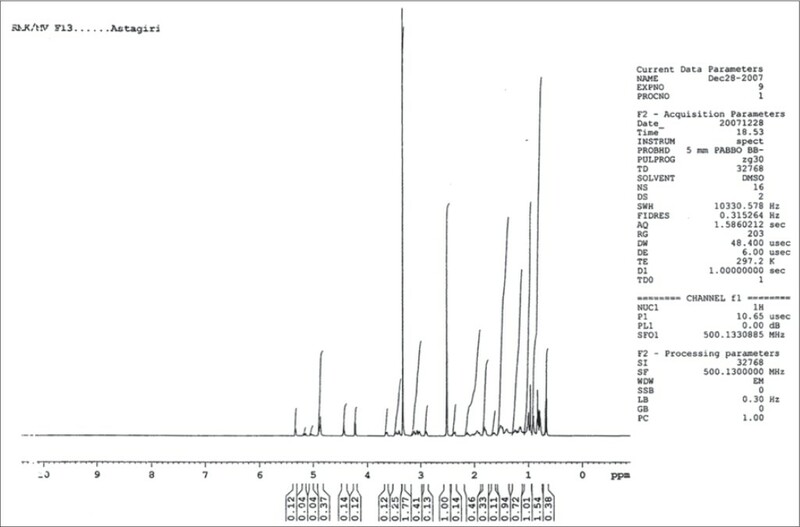 Two compounds were isolated by column chromatography and one of the compounds was identified by various spectral studies. Result : Preliminary phytochemical screening of ethanolic extract of D. cinerea leaves showed the presence of Carbohydrates, proteins, Glycosides, Saponins, Tannins, Aminoacids and Terpenoids. 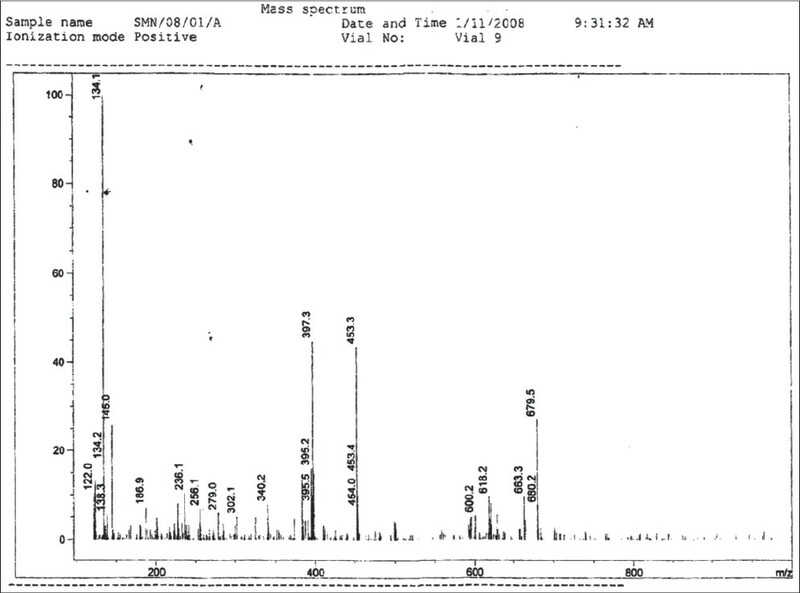 The TLC and HPTLC fingerprint of ethanolic extract were studied and various fractions were isolated by column chromatography and one of the fraction contain β-amyrin glucoside which was confirmed by Infra Red[IR] Spectroscopy, 1 H-Nuclear Magnetic Resonance (NMR), C- 13 NMR and Mass spectroscopic (MS) studies. Dichrostachys cinerea W and Arn, which belongs to the family of mimosaceae is a perennial much - branched thorny shrub sometimes a small tree up to 2 m in height, bark light colored furrowed branchlets ending in spines, indigenous to North West - India, central India, Rajasthan, N. Australia. Leaflets are minute, sessile 12-20 pairs, close, linear or strap shaped oblique, subacute. The leaves of D. cinerea are laxative and used to treat gonorrhea and boils. It is also used as a fodder. Powder from leaves is used in the massage of fractures. The leaf also used as pain killer, in conditions like edema, gout, veneral diseases, swellings, and also naso-pharyngeal infections. It is also used as a diuretic. , Brushed young shoots which are astringent are used in the treatment of ophthalmia, rheumatism and urinary calculi. The plant specimens were collected from forest of Perambalur District, Tamil Nadu during August month and identified and authenticated by Botanist. A voucher specimen of leaves (PCG DC 005) has been deposited in the Department of Pharmacognosy herbarium Madurai Medical College, Madurai. The healthy leaves of D. cinerea was collected during August 2007 at Perambalur, Tamil Nadu, washed and dried in the shade. The drug material was powdered sieved, (powder mesh size 60). The powder was defatted with petroleum ether by continuous hot percolation using soxhlet apparatus then extracted with ethanol (99%) for 6 h. , The solvent was removed under reduced pressure. The residue (2.75%) was semisolid dark green in color; viscous in consistency. 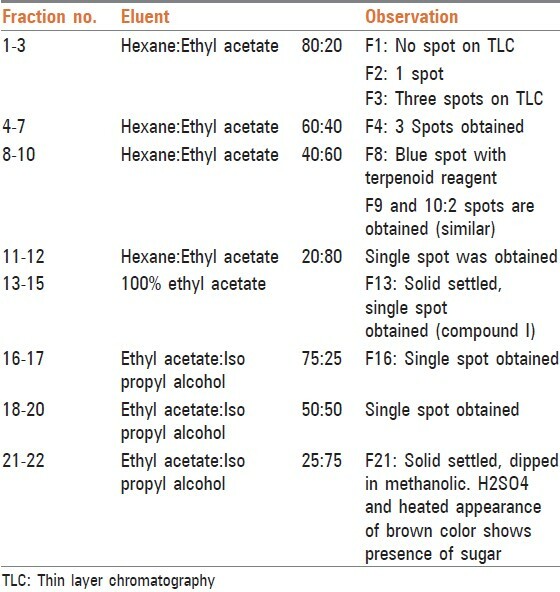 The obtained extract was stored at 4°C until experiments. The ethanolic extracts were subjected to preliminary Phytocthemical tests, TLC with various solvent system by using TLC Aluminium sheet precoated with silica gel 60 F254- Merck and HPTLC were performed using CAMAG HPTLC system. ,, All the solvents used for extraction and isolation was of GR grade and purchased from Merck. The column was packed by wet packing and separation was started by eluting with solvent gradually with increasing order of polarity using hexane and ethyl acetate, Iso propyl alcohol. The entire fraction was collected separately pooled and solvent removed under reduced pressure using the rotary evaporator. The fractionation of the compound was recorded in [Table 1]. Result of chemical tests indicate that the ethanolic extract of leaves of D. cinerea contains alkaloids, terpenoids, proteins, tannins, carbohydrates and no flavonoids. The results are shown in [Table 2]. TLC of ethanolic extract of D. cinerea showed the presence of terpenoids and sugar by using various solvent systems. This is shown in [Table 3]. 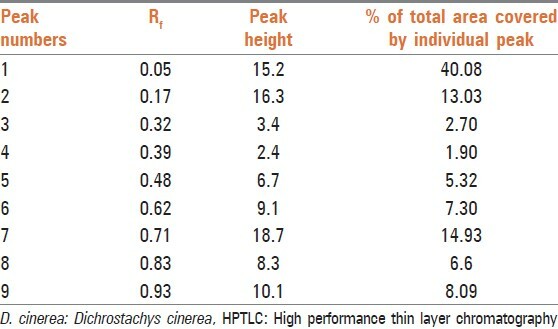 HPTLC profile of ethanolic extract of D. cinerea leaves using Hexane - ethylacetate (7:3) showed nine peaks [Table 4], [Figure 1]. Isolation of compound was performed by column chromatography by using the various solvents of increasing order of polarity and 22 fractions were collected and TLC was performed for each fraction. 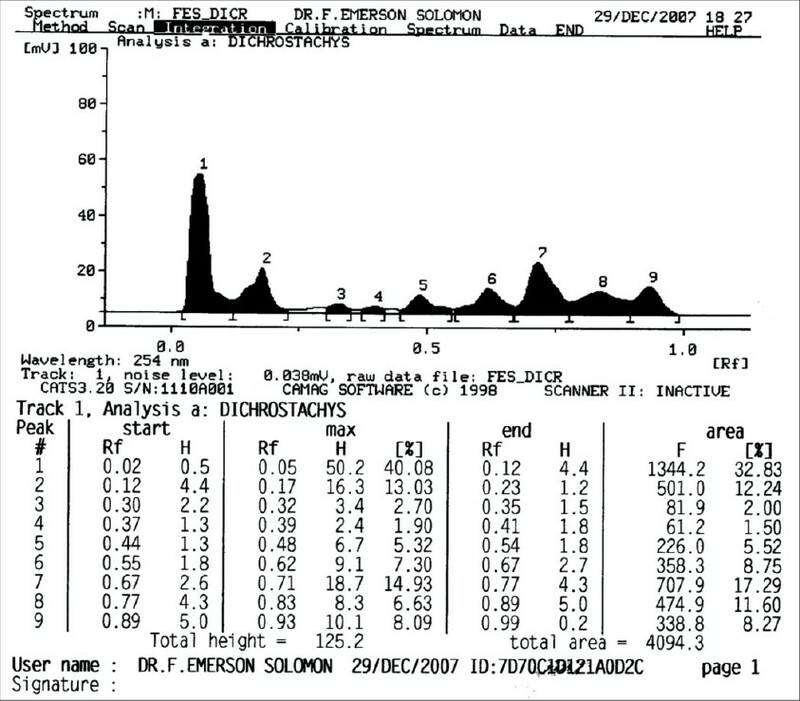 The ethylacetate fraction (F-13) showed single spot in TLC and the solvent was removed by vacuum evaporator. 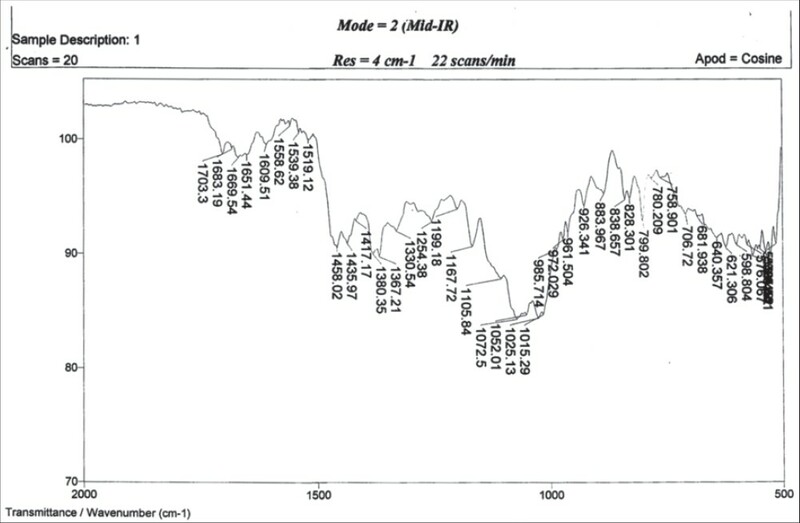 The obtained solid compound purity was further checked by TLC and identified by 1H, C 13 NMR, Burker 500 MHz, DMSO d6 IR and mass spectroscopic techniques [Figure 2]. 25.34 H - 27-0.90 (3H, s) C-28-19.41 H - 28-0.96 (3H, s) C-29-21.58 H - 29-0.99 (3H, s) C-30S21.41 H - 30-1.00 (3H, s) C-31-61.58 H - 31-3.49 (2H, m) C-32-77.39 H - 32-3.66 (1H, m) C-33-101.27 H - 33-4.86 (1H, m) C-34 73.94 H - 34-3.65 (1H, m) C - 35-77.25 H - 353.64 (1H, m) C - 36-70.58 H - 36-3.64 (1H, m) [Figure 3] and [Figure 4]. 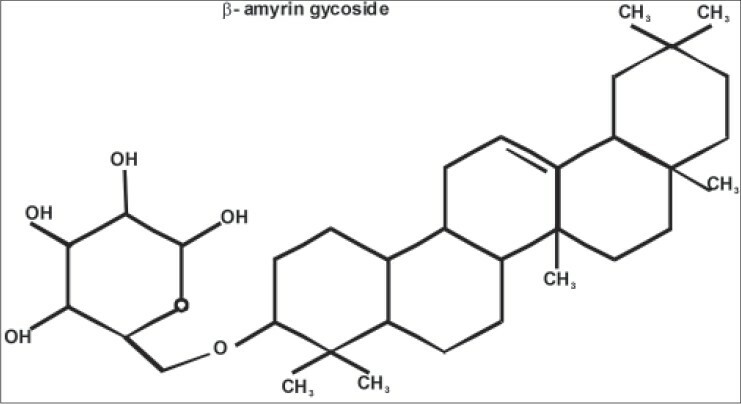 The chemical structure of isolated compound I was elucidated and discussed in the [Table 5] and a possible structure was given below: The β-amyrin glycoside is now reported for the first time in D. cinerea leaf [Figure 6]. Herbal drugs are an excellent source of many constituents. TLC and HPTLC fingerprint profile are important parameters of herbal drug standardization for the proper identification of medicinal plants. In this work, the complete phytochemical investigation of ethanolic extract of D. cinerea were studied by TLC, HPTLC finger print. The compound -1 was isolated by column chromatography and identified as β-amyrin glycoside it was reported first in the leaves of D. cinerea. 1. Anomymous. The Wealth of India. Vol. III. Reprint 2006. New Delhi: CSIR Publication; 1952. p. 56. 2. Varier's PS. Indian Medicinal Plants, Compendium of 500 Species. Vol. 2. Kottakkal: Arya Vaidya Sala; 1993. p. 330-3. 3. Vijayalakshmi M. In vitro antilice activity of Dichrostachys Cinerea (L.) Wight and Arn. Int J Pharm Tech Res 2010;2:2210-3. 4. Mukherjee PK. Quality Control of Herbal Drugs - An Approach to Evaluation of Botanicals. 1 st ed. New Delhi: Business Horizons Pharmaceutical Publishers; 2002. p. 14-24. 5. Kokate CK. Practical Pharmacognosy. 4 th ed. Delhi: Vallabha Prakashan; 1994. p. 117-9, 123-5. 6. Harbone JB. Phytochemical Methods, a Guide to Modern Techniques of Plant Analysis. 3 rd ed. UK: Eswar Books; 1998. p. 7. 7. Bobbit JM. Thin Layer Chromatography. 2 nd ed. New York: Verlogchemise Academy Press; 1966. 8. Randerath K. Thin Layer Chromatography. 2 nd ed. New York: Verlogchemise Academy Press; 1966. 9. Sethi PD. 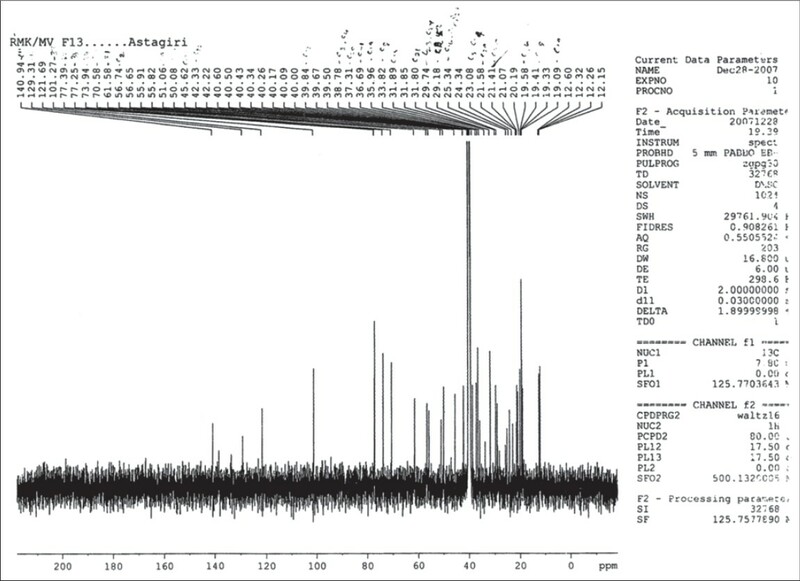 High Performance Thin Layer Chromatography Quantitative Analysis of Pharmaceutical Formulation . 1 st ed. New Delhi: CBS Publishers; 1996. 10. Skoog DA, West DM, Haller FJ, Crouch SR. Fundamentals of Analytical Chemistry an Introduction to Analytical Separation. 8th ed.Bangalore: Eastern Press P. (Ltd.); 2004. p. 920-1. 11. Kemp W. Organic Chemistry. 3 rd ed. London: MacMillan Press Ltd.; 1994. 12. Dyer JR. Application of Absorption Spectroscopy of Organic Compounds. 8 th ed. New Delhi: Eastern Economic; 1991. p. 4-17, 22-32, 58-123. 13. Finar IL. Organic Chemistry. 6 th ed. London: ELBS; 1975. p. 54-60. 14. Furniss BS, Hannaford AJ, Smith PW, Tatchell AC. Vogels Textbook of Organic Chemistry. 4 th ed. New Delhi: Pearson Education Publishers; 1989. p. 1412-34.